NewzScape is designed to run through Usenet newsgroups, downloading everything it finds. It will run non-stop, scouring your favorite newsgroups day after day. All that you need to do is check the Downloads folder from time-to-time to see what files have been downloaded. Mac users: Download with Safari! Not all browsers know what a DMG file is! Each Downloader can have any number of newsgroups that it will download from. You can have as many Downloaders as you want, though you can only run one for each server connection that your ISP allows. The lower bar shows the progress on the current post being downloaded. The upper bar shows the progress through the group. If you mouse-over the upper bar, the program will show you the percentage, which you can see at the lower-right of the screenshot. Supports secure downloading with SSL, when used with an SSL-enabled Usenet server. PixNewsPro only has one Parts folder, and some of you have run up against the limit of files-per-folder imposed by the operating system. NewzScape allows you to assign Parts and Downloads folders to each newsgroup. Many of you use hundreds of keywords to filter posts. NewzScape makes managing large numbers of keywords much easier. PixNewsPro does not have BASE-64 decoding, which is no longer in wide use. However, in some newsgroups the main contributor will use BASE-64, and in those cases it is important to support it. NewzScape can decode BASE-64 posts. Those of you who use lots of Downloaders will now have more screen space due to NewzScape’s new blade mode which lets you shrink your Downloaders to a much smaller size. NewzScape can connect on news-server ports other than the standard 119, which PixNewsPro cannot do. NewzScape has DupeNuker built in. NewzScape has a Coming-Soon window where you can quickly see what multi-part files are being worked on without having to look through thousands of files in your Parts folder. NewzScape allows power users to easily manage many download folders. See the Download Folders window. NewzScape has a Preview Posts feature that allows you to step through posts and decide which ones to download, as well as block undesirable posters. 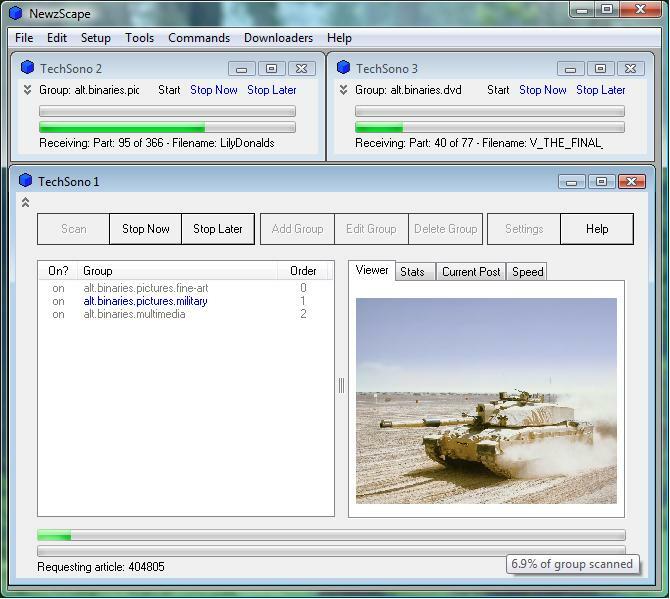 NewzScape can run from the Windows system tray. NewzScape will run on 64-bit versions of Windows, and PixNewsPro will not. Note: NewzScape is compatible with DupeNuker v3.0.0 or higher.